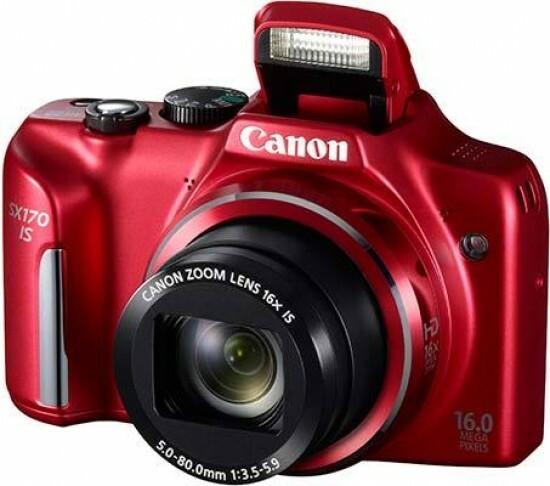 The Canon PowerShot SX170 IS is an affordable high-zoom digital compact camera. It features a 16 megapixel sensor, 16x 28-448mm image stabilised optical zoom, manual modes for controlling shutter-speed and aperture, a range of digital effects, 720p HD video recording capabilities and a 3-inch LCD screen. 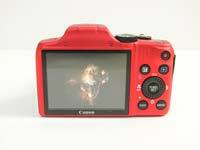 Priced at £169.99 / €199.99 / $179.99, the Canon PowerShot SX170 IS is available in red or black. 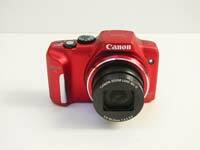 The Canon PowerShot SX170 IS (‘Image Stabilised’), baby brother to the simultaneously introduced SX510HS, resembles a miniature digital SLR but in fact packs a 16x optical zoom (32x digital zoom) into a chassis that will fit readily into the pocket of your jacket, or that of your jeans at a squeeze. We had the version in for review that sports an eye-catching, wine coloured matt finish, though there’s also a regulation issue black option. Manufacturer’s suggested retail price is £169.99, though street prices will inevitably be cheaper still (around £150 at the time of writing). 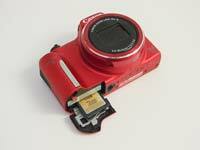 Maximum resolution is 16 megapixels from a standard issue 1/2.3-inch CCD, as opposed to CMOS, sensor. In updating the SX170 IS from 2012, this presumably family-orientated travel zoom/super zoom with a lens reach starting out at a wideangle 28mm equivalent (running up to 448mm in 35mm terms at the telephoto end), squeezes in a flash above the lens that needs to be manually raised before it will fire. The other top plate controls are a familiar shooting mode dial with the usual division of creative P/A/S/M and fully automatic options, including the 32 scenes recognizing ‘Smart Auto’ mode, adjacent raised shutter release button encircled by a lever for controlling the flash, plus an on/off power button sitting just behind it. Press this and the SX170 IS readies itself for action in around 2-3 seconds, which is roughly the same time it takes its zoom lens to whirr from maximum wideangle to extreme telephoto in stills mode. Happily the optical zoom can also be deployed once video recording has commenced, but here it takes a more leisurely 9-10 seconds to move through the same focal range. Though there is some operational noise picked up by the microphone as the zoom does its stuff, it’s kept at a reasonably low level that would be drowned out in busier environments. Unusually perhaps for a camera that is pretty much your standard point and shoot – just one with a longer than average lens reach – stereo microphones sit either side of the lens at the front, with a speaker set into the far left hand edge of the top plate (if the camera is viewed from the rear). At the back for shot composition and replay is a regular issue 4:3 ratio 3-inch LCD screen with so-so 230k dots resolution and operational controls ranged to the right of it. This control layout will be immediately familiar to any recent Canon snapshot (either PowerShot or IXUS) user. Very top right on the backplate, just right of a resting place for the thumb of the right hand, is a video record button for nigh instantly activating HD ‘movie’ recording. In showing its budget ‘credentials’ the SX170 IS offers just 1280x720 pixels clips, rather than the Full HD 1920x1080 pixels resolution of most models these days. Directly below this button, and like it slightly inset, is a means of retrieving clips or stills. This playback button forms one of a quartet of identically sized buttons sitting either above or below a centrally placed function/set button. This one is in turn encircled by a scroll wheel come multi-directional control pad; another familiar operational device. Top left of this and next to the playback button we discover a button for accessing/controlling exposure (+/- 2EV), whilst below it another button pairing for the self-explanatory ‘display’ and ‘menu’. 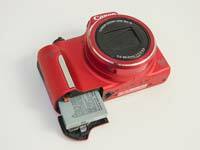 Thankfully in this being a Canon PowerShot, the buttons are large enough and well spaced enough for accessing with the pad of your thumb, rather than requiring fiddly fingertip precision. 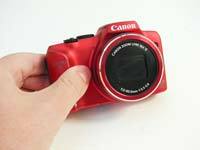 Both flanks of the Canon PowerShot SX170 IS provide a lug for attaching a provided wrist strap, whilst the right hand side – if the SX170 continues to be viewed from the back – features a black plastic flap protecting a single AV/USB output port. There is no wireless Wi-Fi image transferal option with the SX170 IS; at least not a built-in option. Whereas once a camera of this ilk would have been powered by a couple of AAs (as indeed the previous SX160 IS was), on the updated version we thankfully get a rechargeable lithium ion battery provided that slots into the base of what is a subtly raised handgrip – its compartment also including a slot for optional SD card. Canon has further seen fit to provide a proper standalone charger and mains lead – a welcome addition, when many lower priced cameras are now just coming bundled with a USB lead and similarly equipped plug to connect the camera directly to a power source. At the base of the PowerShot sits a slightly off-centre screw thread for attaching it to a tripod; again, so standard issue. Press the on/off button and this JPEG-only Canon whirrs into action, lens barrel extending from within its protective housing sound-tracked by its mechanics to arrive at maximum wideangle setting before the rear screen blinks into life. Naturally said LCD, which offers a fairly bog standard resolution of 230k dots, is the only means here of composing and reviewing photos and video; there is no eye-level viewfinder like you’d find on the DSLRs and bridge cameras that the SX170’s design consciously gives the nod to. Still, the LCD here does offer 100% coverage. The raised shutter release button is nice and springy. But that being said a gentle squeeze enables the user to readily find its ‘bite point’ and for the camera to quickly determine focus and exposure before pressing down fully to take the shot. There are 10 shooting modes on the Canon PowerShot SX170 IS to choose from, with the smart ‘auto’ option the one most visibly highlighted in green. By contrast we also get the familiar program, aperture priority, shutter priority and manual modes. Added to these are a Live View mode, allowing easy exposure and colour adjustment by the user: for example using an on screen slider summoned up via the function/set button to alternate between dark and light, neutral and vivid and cool and warm. Selectable ISO settings range from ISO100 to a maximum ISO1600 – so nothing particularly flashy in this respect. Maximum aperture is f/3.5, so not particularly suite to low light work, despite the inclusion of the low light mode that reduces pixel count to four megapixels to limit noise. Next along the dial, one past the auto mode, is the scene mode setting. The selection accessible here is pretty basic. We get the standard Portrait mode, a Face Self Timer that starts ticking down when the camera registers a face has entered the frame, a low light four megapixel recording mode, a ‘snow’ shooting mode, plus a fireworks mode. These are all selectable via the very familiar Canon compact range toolbar presented on the left hand side of the screen. The next option on the dial is slightly more exciting in allowing us access to digital effects applied at the point of capture. Here we get a familiar fish eye effect, the de rigeur tilt and shift lens ape-ing miniature effect, a pinhole camera ape-ing toy camera effect, monochrome option, super vivid colour option plus poster effect. More unusually perhaps there are several image ratio options on this camera: the familiar 4:3 and 16:9 are joined by 3:2 and more surprisingly 1:1. Continuing clockwise around the 10 option dial we come to a ‘discreet’ mode which deactivates operational bleeps and shutter sound for more convert, or shall we say, candid shooting. 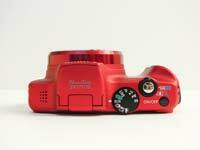 Last but not least on the dial is a dedicated video option, which like with stills provides access to Canon’s My Colours settings, white balance, plus, for video, the option to switch from HD capture to standard definition 640x480 pixels and back again. The Canon PowerShot SX170 IS is light and small enough to shoot one-handed with, though it naturally feels like both hands is the better solution when attempting photography toward the telephoto end of the zoom. Official dimensions are 108x71x43.9mm and it weighs 251g; so it’s solid despite the plastic construction and without feeling a dead weight. The included lithium ion battery, which shares a port with removable SD card media at the camera’s base is good for 300 shots from a full charge according to CIPA testing, which is fairly good for a pocket snapshot. But what of the pictures the Canon PowerShot SX170 IS produces? Can they also be summed up in such glowing terms?